The Canon EOS M5 Mirrorless Camera boasts of a 24.2MP APS-C CMOS Sensor and DIGIC 7 Image Processor that work together to produce quality images. With the help of the 2.36M-dot Electronic Viewfinder, locking that perfect frame is possible through the Dual Pixel CMOS AF and the Touch and Drag Autofocus. Capture multiple images quickly through its high-speed burst shooting of up to 9 fps. Meanwhile, the Digital 5-Axis Image Stabilization ensures that camera shake will not translate to a blurry image. 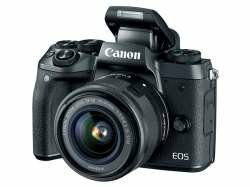 This Canon mirrorless camera also performs well on any light settings with the help of the ISO range of 100-25600. Aside from taking photos, the EOS M5 can also facilitate 1080p Full HD recording at 60 fps. You can view all stored media and adjust camera settings through the 3.2", 1.62M-dot Variable Angle Touchscreen. Sharing the photos and videos online or to other smart devices is a breeze with the Canon EOS M5's built-in WiFi, NFC, and Bluetooth connectivity.